New customer? Sign up here! An original Easter Egg crochet pattern by June Gilbank. 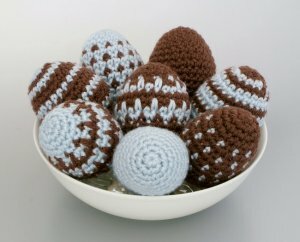 Pattern includes 4 egg designs, so that, using only 2 colours of yarn, you can make 8 different eggs! This pattern is a great way to practice crochet colourwork and maybe learn a new stitch. The four egg designs are arranged in order of difficulty, so that novice crocheters can start with the basic plain egg, and move up through the designs, learning something new about colourwork with each one. The patterns are all designed so that there are no ends to weave in: just drop the unused yarn to the inside of the egg, and pick it back up again when you work back around to it! With no sewing involved, these eggs make a quick and gorgeous Easter decoration. You could arrange them in a bowl or basket as a centrepiece, hang them from an Easter tree, or string them into an Easter garland. Make your own delicious chocolate eggs, but without the calories! Date Added: 09/16/2016 by Guinevere M.
Date Added: 03/26/2013 by Monica B. Date Added: 03/20/2012 by Chrisie M.
Date Added: 01/25/2011 by Sandra Å. Date Added: 04/13/2010 by Cathleen K.
Please note that I sell downloadable patterns and tutorials, NOT completed items. As such, all sales are final. All PlanetJune patterns and tutorials are available in English language only. Looking for more info about this product? See my blog post about it! All content copyright © 2006-2019 June Gilbank. This shop is powered by Zen Cart.